MacPOS Café is an ideal solution for small Cafés, bars and restaurants. 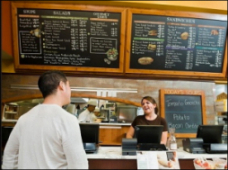 Designed for quick and easy selection of menu items with a customizable touchscreen interface. Fast completion of the ticket makes for happy customers and eliminates long checkout times. The software enables your staff to do their jobs easier and in the process provide excellent customer service. Easily setup new menus by category or department. MacPOS Café includes all of the features of MacPOS Pro plus the ones listed below. And if your Café or restaurant also sells retail items, it will easily handle all of those needs. View the video below to see a ticket being created, selecting a table location and adding an item using the TouchPad interface. 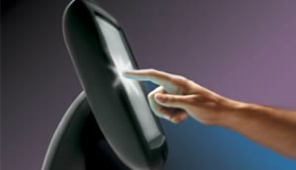 You can use the TouchPad interface with a touchscreen or a mouse. Use the layout manager to change the look and feel of the interface to fit your Mac's monitor. This video is available in HD on Youtube for a detailed view. MacPOS supports industry standard point-of-sale hardware. 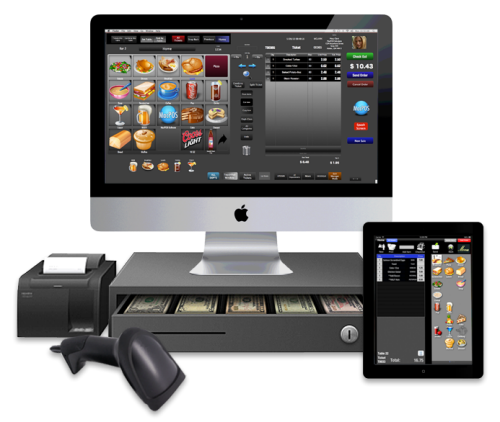 We provide your business with a complete point-of-sale solution from one source. And unlike the many other POS vendors, we know and love Macs. Built-in support for Touchscreen operation or use your keyboard and mouse to control the functions. 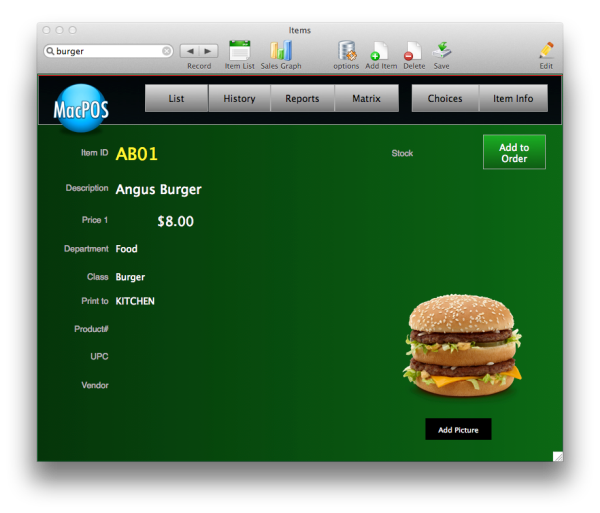 The Items and Products database stores all your menu items and products that you sell. Access extensive Rich-Text documents to record menu ingredients and preparation information. Or access your online store's ordering page. Assign images to your menu items and view them easily and quickly. The Contacts database stores your customer, vendor and employee information. Each contact record can access RTF formatted documents or a Vendor's web page. Assign pictures to your contacts and view them at the point-of-sale. Providing you with more accurate menu item pricing. 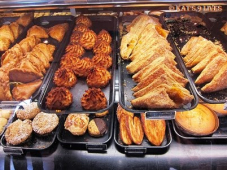 Access important information about the menu items such as ingredients and food preparation. Print tickets to remote printers right from the POS. MacPOS can assist you in managing your busy retail operation. Your customer service is vastly improved with workflow management. The checkout process is faster because repetitive tasks are automated. With a MacPOS solution, your checkout employee scans an item using the barcode scanner and MacPOS automatically calculates the price, including any sales or promotional discounts in place. It also will subtract the item from available inventory. Reward your loyal customers and watch your business grow. Customers can earn points by dollars spent and individual product purchases. 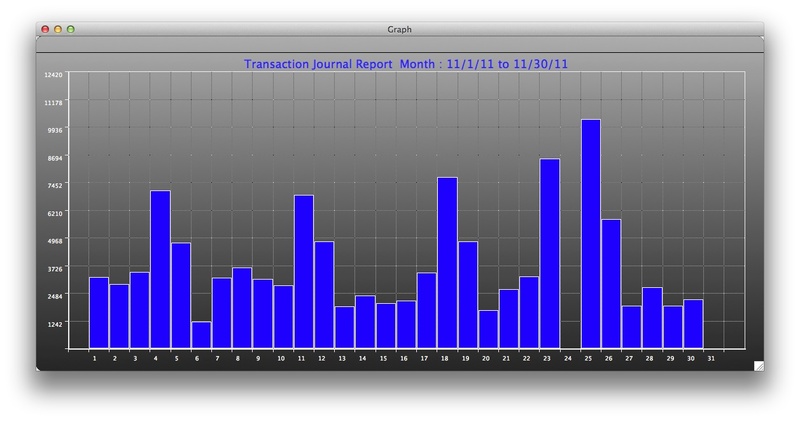 See who bought a product, sales trends and past transaction history of sales and purchases. Keep track of your employees time on the job, track their in store purchases, record personal information including notes, email and phone numbers. Setup the dates and time for items to go on sale or quantity discounts schedules. Print labels for your items sold and include bar codes for increased inventory control accuracy. Modify the look of the database layouts and include only the information and functions your business requires. Modify your printed receipts and labels. Import data from your existing POS or database and export your reports to Excel, Numbers or other database applications. Connect several Macs to one shared database with MacPOS Cafe Pro and additional client licenses for each Mac. 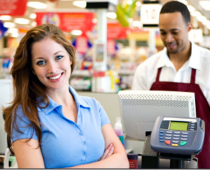 There is support for multiple checkout stations so expansion is easy should you need it. See the monthly sales totals for items and customers for the last month or the last 3 years. See sales trends instantly. Process your credit and debit card authorizations with MacPOS quickly and effortlessly using the built-in Mercury Payment Systems solution with triple DES encryption removing the POS from the scope of PCI-DSS compliance. Swipe your customer's gift/debit/credit card at the conclusion of the sale in MacPOS and in 1-2 seconds you will receive the authorization status. You can use your existing Merchant processor and terminal with MacPOS but it will be slower and probably cost you more money. Save time with the integrated secure processing. MacPOS Café license single location. Add additional licenses as needed. Unlimited Clerks. This is icense purchase with no additional fees. Free updates for one year and priority support. MacPOS Café for use on a single Mac. Add additional licenses as needed. Unlimited Clerks. Up-to-date software subscription and priority support. Cancel or upgrade at any time.